Most of us rely on WhatsApp for instant messaging. Not only is this app free but is also very convenient since everyone we want to chat with is already using the app. One of the biggest annoyances WhatsApp users are always complaining about is its ‘last seen’ feature that lets everyone knows when you last opened the app. While some may not have a problem with sharing this information others believe that it violates their privacy. 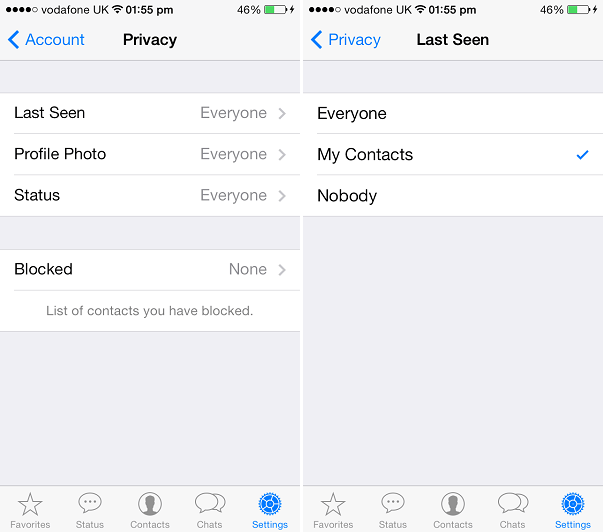 If you are part of the second lot then don’t worry as in this post we are going to show you how to hide Whatsapp last seen status on your iPhone. On iOS disabling this feature is a simple affair. All you have to do is open the WhatsApp application and tap on the Settings button. Next you have to go to the ‘Account’ option and then tap on ‘Privacy’. On the very next page you will find the ‘Last Seen’ option on top of the menu, tap on it. To sum up, you have to go to Settings > Account > Privacy > Last Seen. Everyone: Selecting this option will show your last seen status to every WhatsApp user no matter if he or she is in your contacts or not. My Contacts: If you select this option your last seen status will only be visible to people who are in your contact list. Nobody: If you are looking to hide the WhatsApp status then this is the option you should choose. It will completely disable the last seen status for your account so the app will share this option with no one. Also, on the privacy page you can configure the app to show your profile picture and WhatsApp status to everyone, contacts only or nobody.